Orthomol® Mental is targeted support for mental performance. It contains important micronutrients for brain, concentration and memory. Pantothenic acid contributes to normal mental performance. The omega-3 fatty acid docosahexaenoic acid (DHA) contributes to maintenance of the normal brain function. Vitamin B1 (thiamine), vitamin B2 (riboflavin), vitamin B6, vitamin B12, biotin, niacin, vitamin C and magnesium contribute to normal function of the nervous system. Zinc contributes to normal cognitive function. 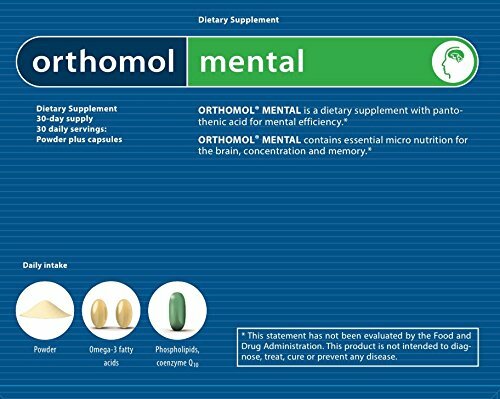 Orthomol® Mental with Pantothenic Acid for mental perfomance, with Gingko biloba and important micronutritients like Vitamins B1, B2, B6, Biotin, Niacin, Vitamin C und Magnesium for healthy mental function. If you have any questions about this product by Original Orthomol®, contact us by completing and submitting the form below. If you are looking for a specif part number, please include it with your message.